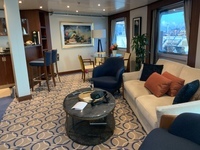 Suite is fabulous although a little noisy as the anchor goes up and down(but we were warned) so not a problem, food exceptional as is the service in the restaurants although it is hurried, no time to rest between courses. I personally would prefer a lighter decor as on Ponant ships. The main dining room is not nearly as ‘clubby’ looking as the smaller Seabourn ships which is good! Shore excursions are too expensive, especially for Vietnam and Cambodia as our party travelled by land a year ago with 5 star accommodation and transport and the charges are Indochina are far less than Seabourn charge. Beds so comfortable with a variety of pillows to choose for personal comfort. While the air conditioning is adjustable in suits the dining ares are very cool for many passengers. Spar area offers fabulous treatments and very well supported as bookings are not easy—-I find the treatments expensive compared to Australia, not the Americans. I have cruised Ponant, Silver Seas, Regent and have to say Seabourn is far superior to those cruise lines in every way—- service, food, actual cabin, even the passengers. 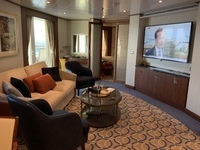 Suite is fabulous although a little noisy as the anchor goes up and down(but we were warned) so not a problem, food exceptional as is the service in the restaurants although it is hurried, no time to rest between courses. I personally would prefer a lighter decor as on Ponant ships. The main dining room is not nearly as ‘clubby’ looking as the smaller Seabourn ships which is good! Shore excursions are too expensive, especially for Vietnam and Cambodia as our party travelled by land a year ago with 5 star accommodation and transport and the charges are Indochina are far less than Seabourn charge. Beds so comfortable with a variety of pillows to choose for personal comfort. While the air conditioning is adjustable in suits the dining ares are very cool for many passengers. Spar area offers fabulous treatments and very well supported as bookings are not easy—-I find the treatments expensive compared to Australia, not the Americans. I have cruised Ponant, Silver Seas, Regent and have to say Seabourn is far superior to those cruise lines in every way—- service, food, actual cabin, even the passengers. Perfect cabin although noisy when anchor is used but we were well informed of this so it is not a problem.